Inflatable advertising balloon manufacturer, Landmark Creations, answers questions about using giant advertising balloons. In episode 4, Tom and Stephanie discuss the basics of using airtight inflatables. A few years ago, Landmark’s Stephanie Meacham hit the road to do a balloon installation for a client in Brainerd MN. In my experience all good road trips require stopping to see a local attraction. 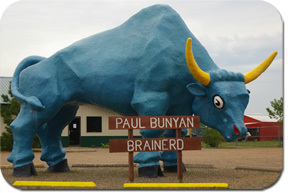 Stephanie was of the same opinion when she made her way to visit the statues of Paul Bunyan and Babe the Blue Ox in Paul Bunyan Land, just miles from the installation site. 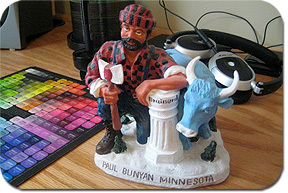 Paul Bunyan, an important part of Minnesota folklore, was a giant lumberjack who worked the logging camps and formed the state. Babe was his exceptionally strong sidekick and did all of the heavy lifting for Paul. Not only did Stephanie visit the statues, she hit the gift shop to purchase a figurine of the two as a memento. Every time she looks at the miniature, she remembers the trip. Just as her memories of the business trip and the visit to Paul Bunyan Land are triggered by her memento, you can trigger long-lasting memories with miniature inflatables. Landmark can create a product replica, logo or mascot into key chains, cup holders, rafts, beach balls or anything that fits the theme of your booth or product. To maximize your impact, combine a giant inflatable in your booth with a replica in miniature to give away like Kellogg’s can with this large arch and small inflatable truck. Now that’s a great way to make a connection over and over, long after the trade show ends.